Charlotte and I met while I was in college. Since that time, she has gone on to do many wonderful things, including creating a popular exercise blog (The Great Fitness Experiment), writing parenting columns for Redbook and Yahoo!, and writing a book--among other things. Char is mother to five and wife to one. She is very witty and fun to read. To give you a taste of her writing, she wrote this post just for you on exercising as a parent. If you love it, be sure to check out her blog and her book, The Great Fitness Experiment . Ohh...psst...and at the end of the post, you might find a giveaway. Sometimes when a man and a woman love each other, they make a baby. (I know you were confused; you're welcome.) Unfortunately that may be the last thing you do that actually makes sense. Babies, even before they make their grand entrance, turn every part of your life upside down. At no time is this more true than during that first year. Between the sleepless nights, extra trips to the pediatrician "and baby makes three" ...times the laundry, hitting the gym often falls to the bottom of the priority list. But you don't need a gym, fancy equipment or even a lot of time to get in a good sweat so here are some moves you can do at home with your little one. 1. The Pick-Up-The-Baby Squat. Being unable to hold himself up, your little bean lays around just like, yes, a sack of beans. But a sack of beans that gets heavier every single day. To prepare for this, do goblet squats. First pick a weight resembling your baby (in weight, not looks - if you have a baby that looks like a dumbbell you have bigger problems than stomach flab.) Then double it. (Do twins run in your family too?) Squat down, pick up weight gently off the floor and slooowwwly stand up. Squat back down, returning weight to floor. Once you've mastered that, swap out the dumbbell for your baby. That's one rep. Repeat 12-15 times, for 3 sets. Be sure to keep your weight in your heels and BOTH hands on the baby/weight. To add difficulty try to pick up dirty burp cloths off the floor with your toes. 2. The non-dominant arm curl. Are you right handed? Then your left bicep is probably bulked out like the Incredible Hulk in the episode where he candy stripes at the hospital nursery (they did that one, right?) because you are constantly holding your mini-me in your left arm so that you can get stuff done with your right arm. To prevent looking as lopsided as an Iranian election, start doing bicep curls on your non-dominant arm. Pick a weight as heavy as you can manage for 8-12 reps, 3 sets. To make it as realistic as possible, hold a carton of eggs in your other arm at the same time. If you end up with quiche, call CPS. 3. The colic lunge. New babies cry. Some of them cry a lot. Like, a lot a lot. Thankfully you can make lemonade out of your little lemon. Not only can you get quads of steel doing this move but you'll earn extra bonus points with your spouse for letting him or her get some sleep. First, plant your feet just wider than hip width apart in a sumo squat. Then holding your swaddled (the swaddle is key!) dumbbell/baby very tightly, lunge vigorously from side to side. This is not the time to be namby-pamby. When I say vigorously, I mean there is no such thing as too much motion to your baby. (Not to be confused with shaking your baby. For the love of Tiger Woods, never ever shake a baby.) Repeat for hours, any time anywhere. Ignore the evil looks from people who think you shouldn't be taking your newborn to the movies, much less lunging like a maniac in the aisle. You may be a parent but you're still a person and are therefore allowed by law to leave your house. 4. The chest press to throw up. Babies are masters of physics. They come out of the womb knowing that what goes up must come down and therefore anytime you hoist your little petard above your head, vomit is going to come raining down. Into your open mouth if you're really lucky. To prepare yourself for this eventuality, lay on your back holding a dumbbell in each hand. Press straight up. At the top of the movement have someone jump on your stomach and then drop a couple spoonfuls of cottage cheese on your face. Surprise is the key to honing your reflexes along with toning your pectorals. Repeat 8-12 reps for 3 sets. 5. Running away from your responsibilities cardio. At some point after your wee one is born, it will hit you how much work, time, money and sleep you are losing in this deal. You will want to pull a John Edwards. This is a bad plan. So the next best thing to running away is to simply run. For added resistance, put the baby in a jogging stroller and take him or her with you. Just make sure your music isn't turned up so loud you can't hear him or her cry. Start with 30 minutes a day 4 days a week, working up to daily sweat fests by the time the kid is old enough to make you have to stop and hold him over the biffy seat in the park for 20 minutes before he decides he's too cold to poop (hey it's a great move for your shoulders!). You can win a copy of The Great Fitness Experiment! Leave a comment about how you work exercise into your day now that you are a parent. The winner will be chosen Saturday, March 5...you have until I pick the winner (via random.org) to enter! Netflix has some watch instantly 10 minute workout video's. I do one or two 10 minute work out's each day. They are short enough that I usually, well, sometimes, can get through the whole workout without having to stop to help a little bitty with a glass of milk or a diaper change or whatever else. At this point, even though it isn't a long workout, I'm just glad to be able to keep the habit going! Working fitness in is super easy… I just stick with yoga and simple stretching exercises while baby's sleeping and then we go for 2-3 walks/day. It's a cinch! I make working out look fun so my kids always want to join me when I pop in a exercise video. We take lots of walks and through out the day I saw lets exercise and tell them to do push ups, sit ups, and boxing. They love it! My baby girl gets up at 7, so I find that if I get up at 6, I have enough time to work out (I'm currently in the midst of the "Insanity" workout series) and shower before nursing her. And on the days that I "happen" to oversleep, the videos are only 40 minutes long, so I have time during her independent play time to bust one out. We also do a lot of walking now that we're living in Asuncion, Paraguay (South America) and don't have a car. You try strapping an 18 pound baby to your chest, and hauling home a weeks worth of groceries in 90+ degree, humid weather and tell me that's not a workout! Ha! Usually I put her in the stroller and go for a walk. She loves being outside and I get in my workout. If the weather isn't so great (which, in England, it tends to lean to the not-so-great side fairly often), I either hit the gym with her–they have a GREAT "mommy" room–or fit in a video at home while she's napping. I can't stop laughing! She is soo witty! Can't wait to read her book! Anyway I am a teacher and my room is upstairs and the office is downstairs so I make it a point to go to the office at least three times in my day…it may not be much but going up and down stairs several times a day makes me feel like I've accomplished some sort of physical activity in my day, because once i'm home I'm ready to just be home and relax with my little girl and hubby! I'm someone who needs the group workout experience, so I go to the gym at lunchtime when I can get away from work. It's nice to have a class (kickboxing, step, hip hop) that has a defined start and end time to get me there. I've always preferred working out after work, but that's all changed of course. When I miss class, I sometimes find workouts on-demand at home and my DD joins in! My husband and I take turns going to the gym. I also, after Baby E goes to bed at night, do my stretching and yoga before bed. I do sit ups while playing on the floor with my daughter. All the time we spend on the floor equals lots of work on Mommy's abs. My fav workout videos are from Lindsay Brin. Once I get baby STTN, I try to get up a bit earlier than baby and get in a little workout. She is a mom too who has had several kids so that inspires me. My abs were more toned after 2 kids and her videos than before kids 🙂 Now I'm preggo w/ #3 so I'm looking forward to getting my body back soon! When we just had one or two kiddos, we did a great deal of hiking. Also pushing the kids in the stroller a mile or so to the park where they can run around while I rest up before pushing them back has been a great work-out, too. before i was pregnant my husband and i traded off days running while the other watched our kiddos. Exercise?! Ha! Practically non-existent. When baby was newborn I popped him into the Bjorn and walked on the treadmill in the evenings. That was the best I could do with multiple kids around. I make lots of extra trips up & down the stairs carrying one or 2 children. That was hilarious! I see a personal trainer twice a week. I must make an appointment with somebody to make the fitness thing happen. I do yoga during my 12-month-old's morning nap. When he drops his morning nap, I'll do it during independent playtime. I do it every weekday so that it's a habit and so I don't put it off. 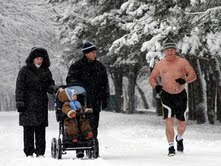 I put my kids in the jogging stroller and go for a brisk walk. I also count dancing in the living room with my 2 year old as a workout. I have a 21 month old daughter and a nearly 5 month old daughter. Both love to be held (arm/core/back strength). The oldest loves to dance with me (all over workout). And we do this thing where I lay down on my back and let her "fly like a birdy" on my feet, which is a good leg and ab workout. For a while I was doing the "put the paci back in baby's mouth every time it falls out during a nap" routine (NO MORE!) so I would get a great workout walking back and forth from the play room to her bedroom. Love you Char! Planning on reading the book!! I find that leaving home to workout just doesn't get done! So I pop in a video while the baby is sleeping or jump on the elliptical and hold her while she's crying. She likes that. I can't get more than 20-30 minutes in before I'm needed… for now. I go on walks and jogs with a jogging stroller, walk with my son in a baby carrier, do short workouts like Jillian Michaels 30 Day Shred while he is napping or during independent play, a couple times a week he plays at the gym daycare while I exercise and I go to yoga in the evenings after he is in bed. My husband and I are excited for warmer weather so that we can go on hikes and bike rides as a family! P.S. My son thinks it's hilarious when I dance. I love the Wii Just Dance game and when he was smaller I would strap him in the Baby Bjorn and dance away :). Thanks for the great post! Great suggestions and love the humor! My 3 girls under 2 yrs and I live off workout dvds and walks since dragging 3 little ones to the gym would be a wicked form of torture for mom! Now that my 2 toddlers are older, they have become very into mimicking mommy so they add extra resistance to all my workouts..my how Jillian & Bob would be proud! Also having next to no tv time is a great way to keep you and your little ones active! The BOB has become our new best friend. He sleeps, I burn calories! Win-win-win!! I run on the treadmill while baby is napping or we take a walk around the neighborhood together in the jogging stroller when the weather is nice! I DVR workouts off of the channel FitTV. Most are 30 minutes, but by the time I fast forward through the commercials, they're around 20 minutes. They are surprisingly effective and fun! My favorite part is that there is a huge variety of workouts so I never get bored. This sounds helpful and fun (and funny). Would love to win a copy! When the older guy is at preschool, I take the toddler in our jogging stroller. When they're both home, I run around after them in the backyard for a few minutes. We dance. Then add in housework and all those meal prep-and-serves and I'm sweating! For some reason my little one gets upset if I'm down on the floor doing an exercise DVD…so that can only happen in the wee hours. I like seeing what everyone else does! Once a week I got to a weight lifting class with some girlfriends. My dear hubby does bedtime and gets some alone time with baby and I get a night out and a firmer bum! We both win! We make it fun and gab all class often getting scolded by the instructor but it gets us out of the house and back into shape.I also try to walk the dog at least once a day weather permitting. When My baby was younger I would time this walk to be one of her morning naps or the later afternoon nap. Now that she is 1 year we use it as part of her wake time. I love getting outdoors if at all possible…hikes, walks,etc. It's even better if someone comes with me to keep it from getting boring. We go running with the BOB jogger…we have the weather cover which keeps him nice a toasty on cold days. He loves riding along (although he generally is snoozing by the end) and I love getting out in the fresh air. Get up before baby, I only have one. Go on walks when it's not snowing. Biggest loser last chance workout DVD. And yoga while baby has tummy time! That's my fave. I joined Stroller Strides so I could work out with other moms and take the kids! I workout while my daughter is in her jumper. I also chase her around the house. She loves running and it's good for me too. I get up in the morning before my two little ones do. I've got the motto-if you want something badly enough, you'll find a way, if not, you'll find excuses.I really believe its time we as mothers stop using our little ones as excuses for not taking care of ourselves. They should be the REASON we take the time for 'me' time. I can tell, on the days I don't workout that I am more irritable and cranky. My body has MORE energy when I workout.Right now I'm doing Beachbody Chalean Extreme while training for a half marathon in June. It can be done, I'm doing it. I have a 2 year old and an 8 month old and have a body that looks better than it did in highschool. I don't sacrifice naps or time spent with them or the husband and I feel GREAT! Thank you to everyone for posting your ways of exercising while being a mom! Char and I greatly enjoyed reading them, and I am excited to try some of these methods out! Lorri, I love your thoughts!